After the Syrian Democratic Forces (SDF) liberated the district of Ayn Îsa from DAESH (ISIS) , in the Northern Syrian province of Girê Spî, the province began to revive. Re-establishing peace and security meant rebuilding a new life under the leadership of women who had played a leading role in regaining freedom. Women have played a major role in the development of the district economy and new independent projects helped to create jobs for many women. More than half of the women in the district had job opportunities within the framework of those new projects set up mostly by the Autonomous Administration. The mother of Mihemed (parents in the region are often called as mother or father of their eldest child) who was a tailor in Raqqa before the invasion of the DAESH mercenaries, was unemployed in Ayn Isa, where the family was forced to migrate to flee the mercenaries’ attacks. The mother of Mihemed then joined a women’s project and picked up her tailor skills once more. 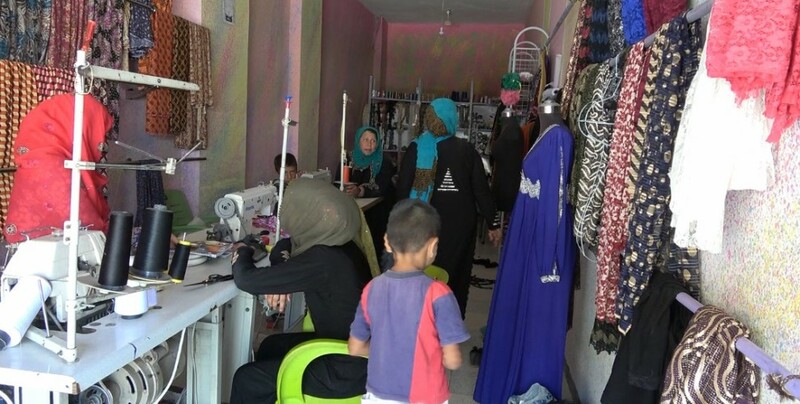 Stating that Northern Syria is starting to work in a free way without fear, after the liberation from DAESH, the mother of Mihemed added that new projects are being set up for the development of women’s economy. Kongreya Star member, Hindi Ibrahim, remarked that they started training processes so that women could get rid of the dark mentality created by the DAESH mercenaries. Ibrahim said women will find support in their profession.